Can you spot the four staging mistakes? Interior decor. Home staging. Two different animals. "Don't follow trends." Good homestaging includes some trends. Trends will make any home look fresh and appealing. You don’t have to honor every passing trend, but something new and stylish gives life to a room. Home buyers often tour model homes, which are decorated with trending colors, the newest furniture, and the latest home accessories. Look current. I don't agree with this technique. Home buyers viewing your home should be noticing focal points that increase the perceived value of your home, not the orange pillows on the couch. A staged room doesn’t want pops of color. A staged room wants to be seamless and layered. It wants to be interesting but not in-your-face, like a tastefully dressed but approachable woman at a meet and greet. Lose the pops, please. "Buy what you love and it will all work together." It probably won’t. A well-designed room is no accident or collection of oddities. A room that buyers are attracted to takes some forethought, even if it was professionally decorated by an expert interior decorator. When it’s time to stage, the décor rules change. "Look in your closet to determine what color palette is right for your home when it's for sale." Although you might determine your personal color preferences, that’s no guarantee you’ll find the right color scheme for staging a home. once you sell your staged house and move to your next home. "Paint a closet a fun color. Or paint a ceiling a fun color." Don’t put stumbling blocks between a buyer and a purchase offer. Most people do not like to paint. They want to buy a home that’s move-in ready. They don't want to wait for a painting crew, don't want to live in a home being painted, don't want to pay painters. 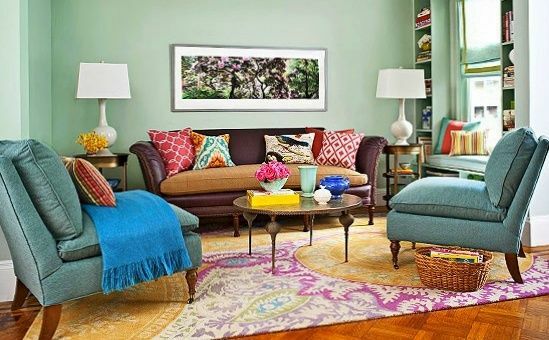 Choose paints that will have the widest appeal possible, colors that don’t call attention to themselves. Closets and ceilings should be white. Period. Ignore what the frou-frou decorators say. "Stencil designs on your wall." Step away from the stencils! Stenciling an entire wall is fashionable with DIY decorators and home décor bloggers right now. But a wall of design, no matter how tasteful, is restrictive. What are the chances it will be appropriate for the new owner? Painting over a stenciled wall is more difficult than painting an ordinary wall because of the raised paint edges and uneven texture left by stenciling. 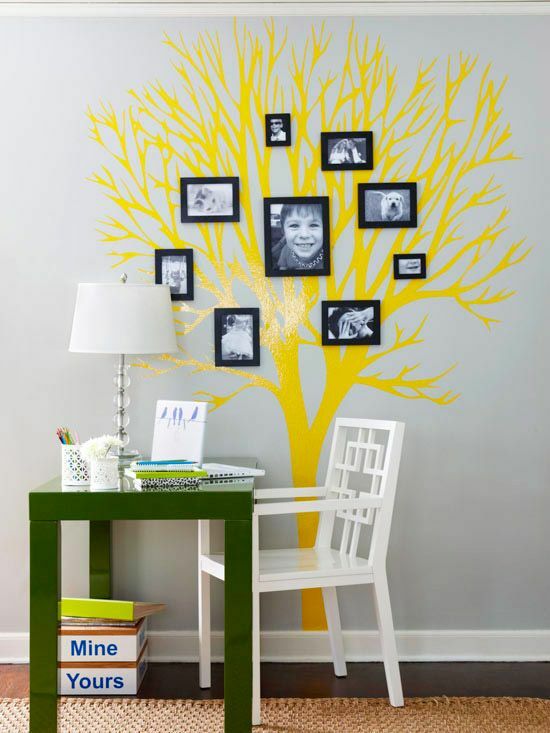 Stenciling a wall is one of the mistakes in the photo above showing a yellow tree on the wall. The other staging blunders are: colors are too bright, the photos are too small, and the photos show family members. will fall in love with the same wallpaper you have. "Don’t save your wedding gifts and heirloom possessions for special times. Display and use them." That's decorating advice, but not staging advice. Staging advice is that you should pack these sentimental and valuable household items away. There is always the chance that something will be stolen from a home on the market. Why take a chance, when you can stage a home with ordinary art and accessories instead of precious belongings or expensive antiques? "Use wallpaper in unexpected places like a powder room, pantry or small foyer." All wrong! 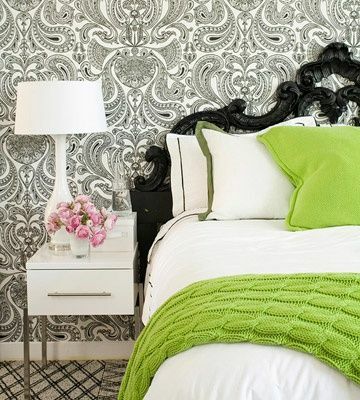 Buyers do not like to see wallpaper. Chances are they’ll want to change it. 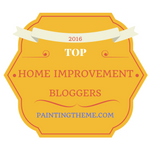 Painting walls is faster, easier, cheaper, and smarter for homestaging than wallpapering. "Use robe hooks instead of towel bars to save money." Another veto. This tactic looks cheap, even if you are doing it to be stylish. Also, I question that towels dry thoroughly when they hang from a hook. shelves like these. All photos BHG. 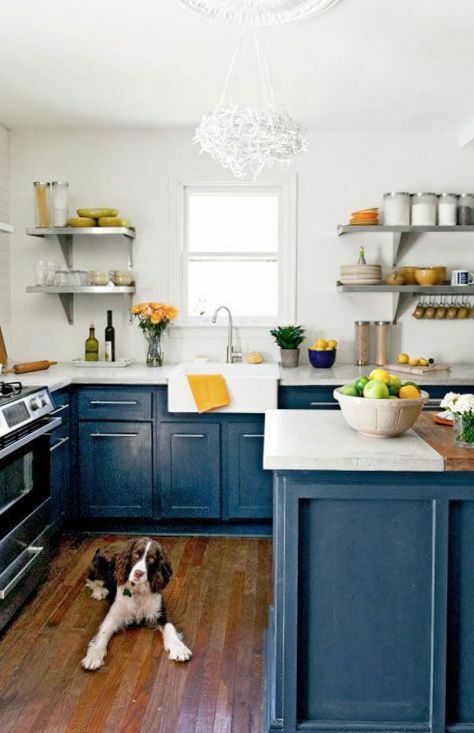 "Replace your upper kitchen cabinets with open shelving." I know it's in style and I can think of some instances where this approach would work: a minimalist’s kitchen, a small vacation home, or a loft where the owners hardly ever eat in. Most buyers will want closed storage. Are you sure you want all your dishes on display? Do they look THAT nice? And do you want dust and cooking oils to settle on all your dinnerware and glassware? Although all buyers might not be thinking ahead to these problems, some would, so why chance it? "Paint your trim a dark or interesting color." Spaces look bigger when edged in white, and dark trim closes spaces. Buyers want big. Give them clean, classic white trim. It will go with whatever wall colors new owners want in the future. Painting trim is time-consuming. 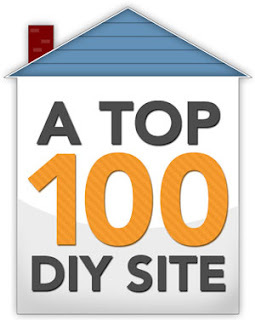 It looks crappy if you do a poor job, devaluing your property. It’s expensive if you hire painters to paint trim. Keep your trim white. "Choose lighting that will flatter yourself and guests." Forget this. Choose lighting that will make your rooms look spacious and clean. This is no time to create moody ambiance with subdued lighting. Make it easy for a Realtor to illuminate a room without circling the room to turn on lamps, even if it means you put timers on lamps. 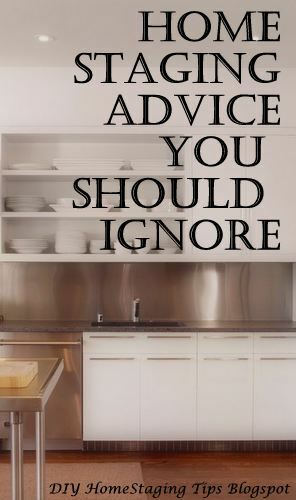 To get more advice on staging your own home, be sure to download my $4.99 eBook, DIY Home Staging Tips to Sell Your Home Fast for Top Dollar. Why make mistakes, when you can do it right and make your home sale go faster and more profitably?